Mammoth Lakes electric vehicle advocates have joined together to form the Eastern Sierra chapter of the Electric Auto Association with the hope of spurring the installation of non-Tesla EV charging stations. The ski center and destination resort of Mammoth Lakes is the largest town on US 395 that runs north and south along the eastern side of the Sierra Nevada. The city is 40 miles north of Bishop, the second-largest population center on the US 395 corridor, and 30 miles south of Lee Vining, the gateway to the eastern entrance to Yosemite National Park. Formed by Electric Auto Association President Raejean Fellows and Don Condon, the chapter hopes to initially drum up interest in installing J1772 Level 2 stations. Fellows and Condon live in the community and have noted the lack of public, non-Tesla charge stations. Tesla operates a Supercharger station in Mammoth Lakes with eight charging kiosks. 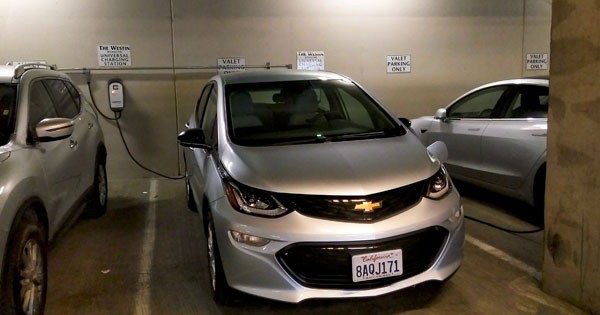 Four resort hotels operate Tesla destination chargers and J1772 chargers for customers. There are no public charging stations of any kind in Mammoth Lakes. The new EAA chapter is also working with organizers of the Solar Pavillion in Lee Vining to install a J1772 Level 2 station in Hess Park. One Chevy Bolt driver had her car towed 200 miles by AAA from Mojave to Mammoth Lakes for the summer because of the absence charge stations on US 395. Condon is meeting with ChargePoint's regional representative this week. For more information, contact Condon at 510-467-2197.